Sherlock Special To Air On New Year’s Day 2016! Starring Benedict Cumberbatch, Martin Freeman. Time to grab your deerstalker caps and favorite pipe everyone because BBC One and PBS/MASTERPIECE have announced that the New Sherlock Special is scheduled to Premiere on New Year’s Day 2016! What a way to ring in the New Year! 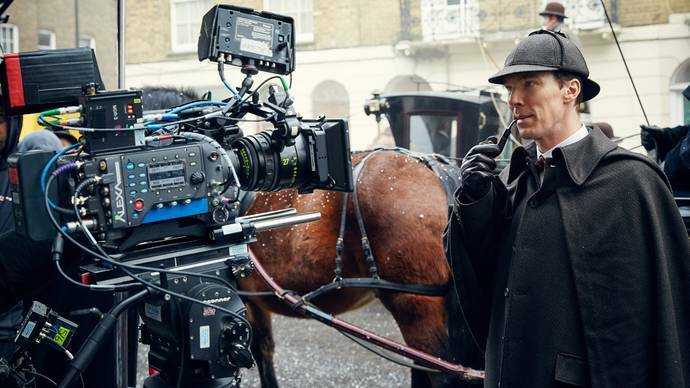 A New Year’s Day treat for us all…Sherlock is back! It will have been nearly TWO tortuous years years since we last saw our favorite consulting detective and his sidekick, made more tortuous by the fact that US audiences did not get to watch the series at the same time as the UK, but had to wait several agonizing months! Well, we shall wait NO longer because PBS confirmed that, for the first time, Sherlock will enjoy a US-UK Same Day Premiere!! Finally a US-UK simultaneous telecast! Perhaps they learned a thing or two from Doctor Who? And so, with champagne and left-over blow horns in hand, US audiences will get treated to, Sherlock: The Abominable Bride, a 90-minute special, starring the glorious Benedict Cumberbatch (The Imitation Game) and our favorite Hobbit, Martin Freeman as they return to 221 B Baker Street as our beloved Sherlock Holmes and Dr. Watson. And the delightfully creative Mark Gatiss and Steven Moffat have taken our heroes to 1890’s London!! 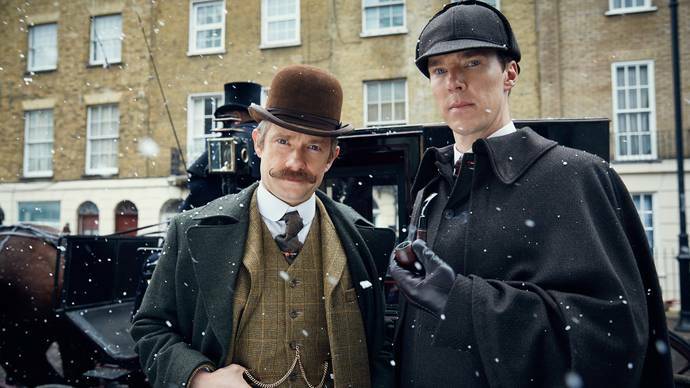 We are finally going to get to see Sherlock and Watson as they were meant to be seen…in Victorian London! 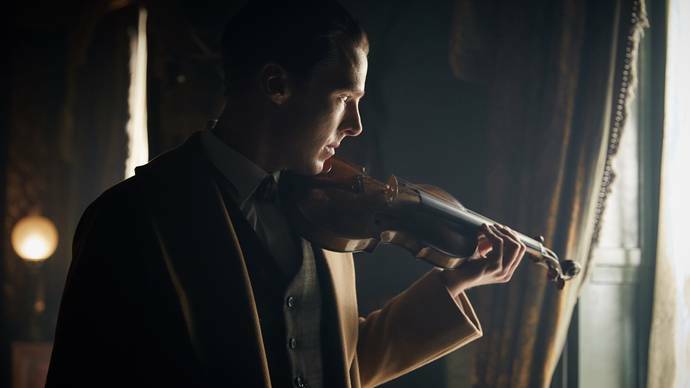 Beautiful picture of the Cumberbabe and his violin. And if that wasn’t exciting enough news, it has also been announced that Sherlock Season 4, will go into production in Spring, 2016!!! I’m camping out at Speedy’s Cafe now! Benedict Cumberbatch, exactly where he belongs, before the Sherlock cameras! WhooHoo! It shall be Happy New Year, indeed! 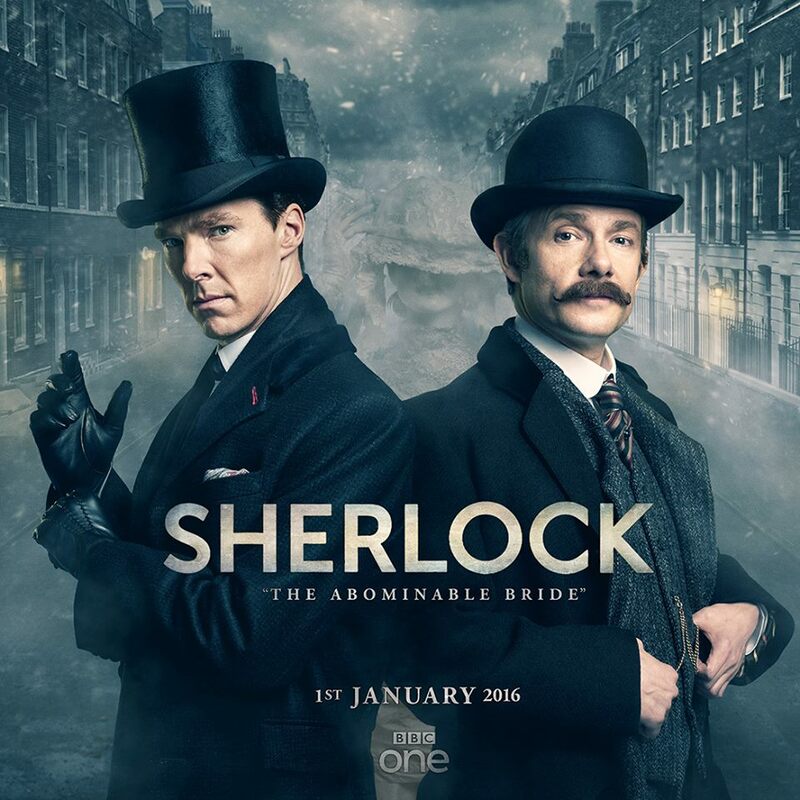 Sherlock: The Abominable Bride,will premiere Friday, January 1, 2016, on MASTERPIECE Mystery! on PBS at 9:00pm ET, and simultaneously online at pbs.org/masterpiece. And on BBC One in the UK. The special will have an encore broadcast on Sunday, January 10, at 10:00pm ET. Lady Anglophile…getting our her best Victorian frock for the occasion! This entry was posted in British Telly, The CumberWatch and tagged BBC One, Benedict Cumberbatch, Martin Freeman, PBS/Masterpiece, Sherlock. Bookmark the permalink.